Jed built a full wine bar in our dining room and it looks AMAZING. 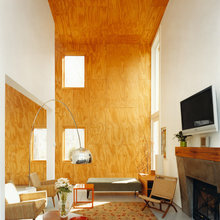 They took a plain wall and made it a beautiful architectural focal point. Him and his team were very professional and clearly care about the work that they do. They went above and beyond to make sure that what we envisaged came to life. Jed and his team were always on time, very responsive, and friendly. I would hire them again in a heartbeat. We had an idea for custom beds, but needed a designer/builder to make it a reality. Fortunately a friend recommended Jed Dinger Design and we couldn't be happier with the outcome! 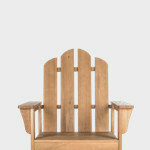 Jed made great design suggestions and the craftsmanship is excellent. Everyone we worked with at Jed Dinger Design was extremely professional and reliable. Thanks Beth! This would be our first bunk bed project, and hopefully not the last. We enjoyed designing and building it. 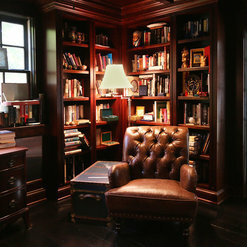 Staggeringly beautiful cabinet-bookcases for basement: the Dinger Design team crafted some of the most excellent custom-made cabinetry I have seen. The precision of all cuts and the superior grade of finishing is without equal. Even the installation was a significant work of excellence. There simply aren't words to describe the satisfaction these new built-ins have brought to the living space in which they are installed. Working with Jed and his team was truly a delightful experience. Jed is a true professional, a beautiful and thoughtful designer, and a clear communicator. We asked him to design built-in bookcases and a custom mantle and fireplace for our new contemporary townhouse that would blend with our traditional taste and furniture. We love the finished product and would not change a thing. Thank you Deborah! If you have any other needs, we'd be happy to work with you again. TL;DR: Jed is smart, meticulous, diligent, fair, and highly skilled. 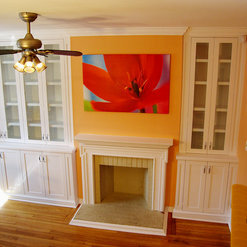 If you are doing custom millwork in your home, you should hire him. Jed's team built the cabinets for a custom kitchen in our new home. We had prepared detailed drawings of what we wanted, and we shopped them around to three different custom cabinet vendors. Jed's bid was the lowest of the three, his reviews on this site and Angie's List were the strongest, and when we met him in person he had a great handle on the project, even at an early stage. So we felt very confident hiring him. Throughout the process, Jed was excellent. We gave him our vision of how the kitchen should work and he brought that vision to life, remaining faithful to our core ideas while suggesting thoughtful improvements to our design, and then executing that design with impeccable craftsmanship. When issues arose (as they inevitably do), Jed worked with us to arrive at outcomes that were reasonable and fair. And as the house has settled, Jed has been back to continue supporting his work with additional tweaks to the cabinets. The kitchen is the best kitchen I've cooked in, and the quality of the cabinets speaks for itself. Jed and his staff were an absolute pleasure to work with, from the design phase through the very quick, two day installation. He designed, built, and installed a floor-to-ceiling built-in entertainment center and a dining room buffet (including a desk area) for our house built in 1900. We couldn't be happier with the finished products. The whole process took about 5 months (from initial meeting to installation). Jed was upfront about the timeframes and stuck to them. 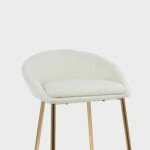 I believe he charged a fair price for the excellent customer service and quality workmanship. I can't say enough good things about this company and I can't wait to work with them again. 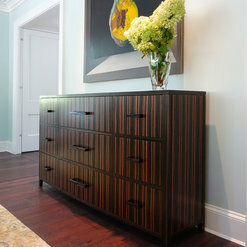 I am so pleased with the media and storage cabinetry they built (see photos), and the nifty little entry hall console they created for an unusual space (not pictured). I was particularly impressed with Jed's collaborative design process--he really generated everything that's good about my design, helped me articulate my goals, and provided multiple, iterative, drawings to ensure that we were on the same page. And the craftsmen who built and installed the product were highly professional, including performing a last minute modification that was due entirely to an oversight on my part with good cheer and precision. 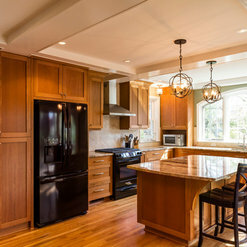 I had built in cabinets installed in a prior residence by one of those mass-production cabinet companies and the difference between working with Jed and that other company is truly night and day. This product was worth every penny and more; I'm so glad I found this company. Not sure what to say, either I had unrealistic expectations because of all the raving reviews I saw here or I am just unlucky. My project is over-budget, over-time and unfinished at this time. I share your frustration over the lighting component of the project. LED lights are difficult to pin down in terms of color. Photos on the internet can be inaccurate. The best way to evaluate them is to order them and then see them in context. Please keep your faith in us, as we've been in touch to schedule an additional visit to you home with new options for you to evaluate. Once again, at no additional cost to you. Jed and his team designed and built bookshelves around our fireplace. They were the utmost professionals throughout the job - held true to their deadlines, flexibility in schedule, and high levels of responsiveness. The design and build that they did was superb. 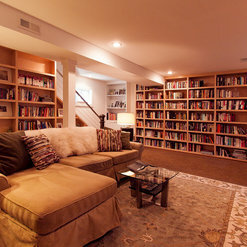 The bookshelves look like they were built along with the house. Would recommend without reservation. Thanks for the kind words Dan, it was a pleasure working with you. Great communication throughout. 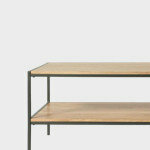 We wanted a custom shelving unit constructed in our town home. The space was between two chimneys original to the house. 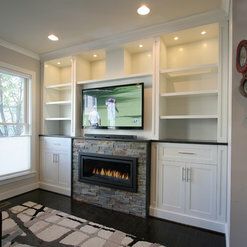 We wanted a split unit with a cabinet below and bookshelves above, with space for a mounted television in the middle. The space had a few complications: the house is old (1890) so the angles are a bit off, there were outlets in the floorboard that needed to be tied into the unit somehow, we wanted all cables and wires hidden but accessible if needed, and there were high velocity HVAC vents in the ceiling that needed to be tied into the design. We also wanted a style that would look classic but still fit with the modern renovations that had been done to the home. It was an excellent project from start to finish. Jed visited our home, examined the space, discussed our goals, provided some useful suggestions (especially regarding style), and then drew - on the spot - a detailed scale pencil drawing of what we could expect. It was exactly what we had in mind. 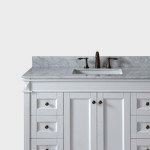 He addressed the architectural and technical challenges in detail, and generally put us at ease. The consultation came with a small cost that we could credit to the project if we were to proceed. He sent a proposal with detailed drawings, itemized costs, and a project plan with a timeline for completion. We signed the proposal and submitted a deposit. He returned for detailed measurements and to walk us through some final design choices. A few weeks later his crew spent an entire day at our home for the installation. They were friendly and efficient. The finished product exceeds our expectations. It is simply beautiful and looks original to the home. It has increased the utility of our living area and improves the elegance of our home while managing to not look out of place. The design challenges were all overcome: the electrical, cable, and air vent considerations were all addressed thoughtfully. This is one of the most expensive projects we've undertaken in our home, but craftsmanship like this is worth the investment. We will undoubtedly call upon Jed and his team again. One final note: we have an enthusiastic dog that really likes playing with visitors. Jed and his crew were the best dog people I've ever met among all the crew and vendors that we've ever invited into our home. It's a minor thing but it sets this team apart in yet another way that any pet owner would appreciate. 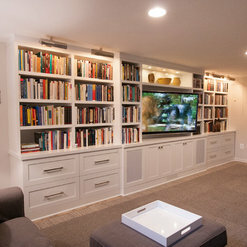 Jed and his team designed and installed a large solid maple built-in system for a home office, including two desk areas, file cabinets, and bookshelves. I couldn't be happier with how the process went and how it looks. Would use them again in a heartbeat. Jed and his team did a really impressive job on our mudroom cabinets! Jed was great to work with in planning out the project. And Andrus and Chris executed the install flawlessly. 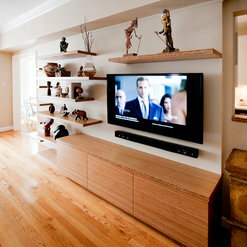 The quality and finish of the built-in cabinets was great. It was clearly evident during the install the expertise that Andrus has and his attention to detail was what really made the project. There's no questioning the quality you're ensured to get with this company. Thanks for your kind words and for posting the images. 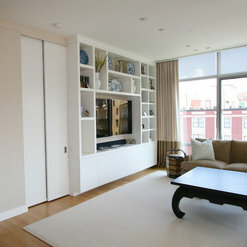 It's hard to imagine the space without the cabinetry.